Autodoc is the world's leading software to create detailed firewall configuration reports automatically, just by opening a WatchGuard, Fortinet, Sonicwall or Palo Alto Networks configuration file. The reports are displayed on the screen and can be printed or exported to HTML. 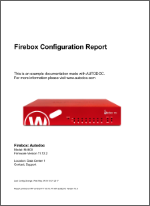 You need a detailed documentation of your firewall configuration? Would you like to audit your firewall? Would you like to compare two configurations? You want to set up a new firewall based on the configuration of the old firewall? Such tasks usually involve a lot of work. 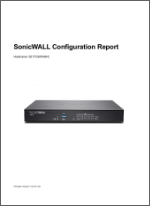 It is almost impossible for the firewall administrator to create accurate documentation. He rarely has the necessary detailed knowledge of the system. In addition, the manually created documentation has to be adapted again and again when the configuration changes. Autodoc supports you in such tasks by automatically generating a detailed report from a configuration file at the push of a button. Thanks to Autodoc's tabular display, you can quickly check firewall settings without having to search the configuration file for individual values. Autodoc allows you to save the report as HTML or PDF. To generate a PDF, a PDF printer driver is required for Windows XP and Windows 7. Starting with Windows 8, this function is integrated in the operating system. By comparing two reports, you can quickly and easily compare the corresponding configurations with each other. 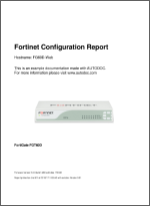 The following examples each show you a report of the corresponding firewall manufacturer as a PDF file. With the demo version, you can also create a free report with your own configuration.